Miami's LeBron James celebrates with Dwyane Wade after Chris Bosh scores the game-winning basket against Portland in a 108-107 victory at the Moda Center. 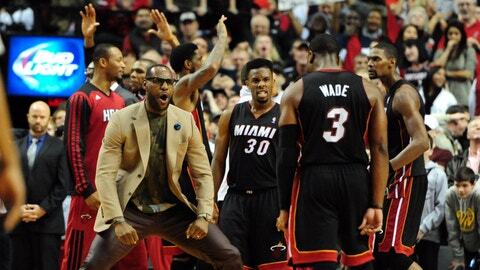 The Miami Heat may again be without LeBron James on Monday night when they visit the Denver Nuggets. But given the way they played without him – and the Nuggets’ recent tailspin – it might not keep Miami from improving its already impressive record against Western Conference foes. James missed his first game of season Saturday against Portland after injuring his right groin in Friday’s overtime loss in Sacramento. He warmed up prior to the game but was declared inactive and is considered day-to-day. "We were thinking health first and big picture. He understood," coach Erik Spoelstra said of James, who leads the team with 25.4 points, 6.9 rebounds and 6.5 assists per game. James’ 59.2 field-goal percentage also ranks fourth in the NBA. "When he went out there he knew he wouldn’t be able to push it," Spoelstra said. Regardless, Miami (23-7) got a Chris Bosh 3-pointer with 0.5 seconds left for a 108-107 victory – the Heat’s seventh in eight games – over the Trail Blazers. Bosh was 3 of 3 from long distance on the night and finished with a season-high 37 points to go with 10 rebounds for his second double-double in three games — matching his total from the previous 26 contests. "My call at the end of the game was much more conservative," said Spoelstra, whose squad is now 8-1 against West teams. "I drew something up to get him on the move and he said, `No, I want it for the 3.’ So he overruled it and became a prophet." Bosh’s 2012-13 season high of 40 points came in a win over Denver on Nov. 3, 2012. Miami improved to 8-7 all-time without James, who is averaging 32.2 points and 8.8 assists over his last six games versus Denver. The Nuggets (14-15) are trying to avoid losing a seventh straight game for the first time since an eight-game skid from April 1-16, 2003. But they haven’t showed much to believe their slide will end against the Heat after allowing Memphis to shoot 51.6 percent from the field in a 120-99 road loss Saturday. Coach Brian Shaw’s club surrendered a season-high 65 second-half points. "There are a lot of things that we can take away from this game, and the five games before that," Wilson Chandler said. "If we want to win, we have to play harder, that’s what is all comes down to." Even with Kenneth Faried returning after missing two games with a sprained ankle, Denver was completely dominated on the glass, getting outrebounded 46-25 and giving up 20 second-chance points. "We have to do something," Chandler told the team’s website. "We have to get our minds right because we have a good team coming in Monday." Denver had won 10 in a row at home versus Miami until a 98-93 loss on Nov. 15, 2012. Nuggets leading scorer Ty Lawson (17.5 ppg) was 0 for 7 with zero points.